The motorcade carrying US ambassador to Bangladesh Ms. Marcia Bernicat was attacked by armed men who chased the vehicles and threw bricks at it in a latest sign the violence in the major Asian nation is spiraling out of control. The US State Department confirmed the events, stating that Ms. Bernicat was able to leave the troublesome zone unharmed. Over the weekend, more than 100 people were injured when police fired rubber bullets at demonstrators, mostly students who started protesting a week ago in the capital Dhaka, demanding better road safety. 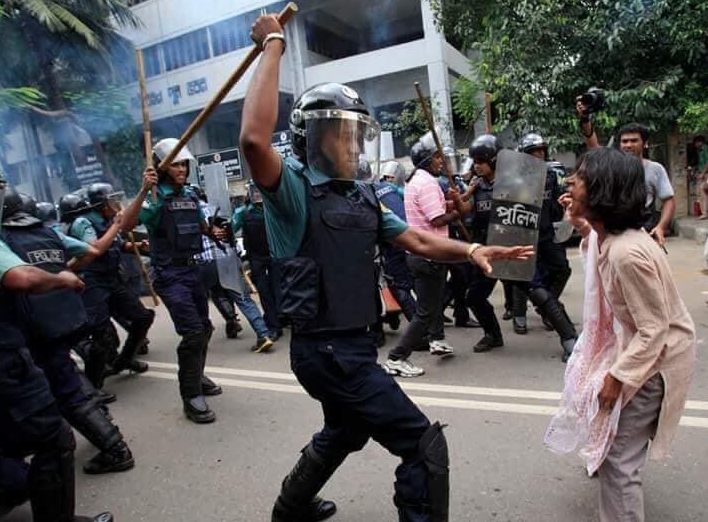 Bangladesh Prime Minister Sheikh Hasina urged the protesting students to go home on Sunday as police fired tear gas at teenage protesters during the eighth day of unprecedented demonstrations which have paralyzed parts of the capital Dhaka. It all started last week after two students were killed by a speeding bus, driven by a chauffeur without a proper driving license. Students organized themselves via social media and started demonstrating in ever greater numbers. However, over the weekend, the protests grew violent as police started an operation to sweep the streets. As a large crowd marched towards the office of the ruling Awami League party, police at first fired tear gas into the crowds, who kept coming. According to student statement on social media, the ruling political party then sent ‘mobs with machetes’ to try and disperse them, leading to an ever-increasing violent tension. Twelve students were treated at Dhaka Medical Colleague Hospital with clear machete wounds. Prime Minister Mrs. Hasina, seeing the danger to her own reputation, was quick to point out that a possible "third party" was sabotaging. In a call to the parents of the protesting students, she stated: "That's why I request all guardians and parents to keep their children at home. Whatever they have done is enough." All of this over road safety?